Your Midi Fighter 64 comes bundled with 5 amazing soundpacks from Shawn Wasabi, Choke, ill. Gates, Mad Zach, and Apoth! 1. Open the email we've sent you titled "Thanks for your order..."
2. Click the link about halfway down the email titled "Download your Midi Fighter 64 Exclusive SoundPacks Here". A 450MB file should begin downloading. 1. Once your soundpacks are downloaded, you'll need to unzip the file. On Mac, simply double click the .zip file. On PC, you'll need a program like WinZip. 2. Locate the soundpacks folder that you've just unzipped. Choose the soundpack you'd like to open, and double click the .als file. This will open up the soundpack in Ableton. If you don't own Ableton already you can get their free 30 day trial by following this link, once installed you'll use the serial number sent to your inbox to activate it. 1. If you need to map your unit to something else than a Drum Rack make sure “Notes+CCs” is selected as MIDI Type in the MF Utility. Otherwise, skip this step 1 and move onto step 2. 4. Go to the "MIDI Ports" section and turn REMOTE on for the input and output of the Midi Fighter. You will also need to turn TRACK on for the input and output of the Midi Fighter if you wish to use yours for finger drumming as seen here. More information about what this means is available in this article. 5. Once that is done, all you need to do is arm a track with a SoundPack drum rack in it and you should be good to go! Use your mouse to activate the red "arm" button so pressing buttons on your Midi Fighter tells the computer to trigger sounds. 1. Download the Midi Fighter Utility, it is an essential tool for configuring and updating your Midi Fighter. You'll be guided through install via the software. 2. Plug in your Midi Fighter 64 via USB (do NOT use a USB hub) and follow the onscreen instructions in the utility. You'll be prompted to update your firmware as new firmware updates are available. If no new firmware updates are available, it's time to finger drum! 5. To quickly color multiple LEDs one color, click (and without releasing the click) simply drag your mouse to "paint" the LEDs your chosen color. 6. Once you've finalized all your color selections, just hit the blue "Send To Midi Fighter" button. You'll now see these LED colors on the 64 hardware. 7. You can actually have "off" be one color, and "on" be an alternate color. Meaning if the button is not pressed (off) it will be red, and if you press it (on), the same LED will turn white, for example . The inner circle is the "off" state, the outer circle is the "on" state. Follow the same steps (3-5) as before to achieve this. Light Shows take a bit more work than a simply changing the colors of LEDs, but done right really take a performance video to the next level. Basically, LED light shows are achieved by sending velocity information to specific buttons on the controller. With a few technical how-to’s set aside, this is the foundation for a lightshow. Velocity dictates Color. 1. 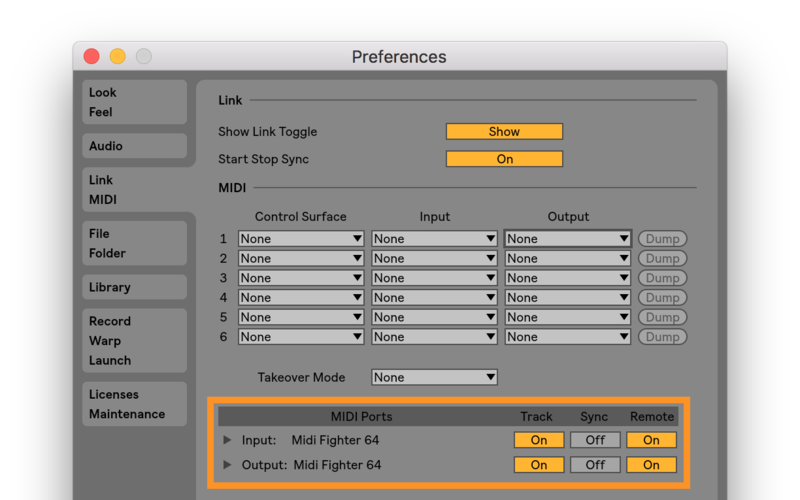 Make sure your unit is sending and receiving midi information (Ableton preferences). Step 3 from "Ableton Setup" higher up on this page. 2. Make sure midi information is being sent to the right device on the right midi channel (midi fighter 64, midi channel 3). Enable this in the Midi In/Out dropdown menu above the volume fader on your selected midi track. Then create a midi clip that contains one note (C3), with a note length one bar so you can clearly see the LED on the 64. Note length can be adjusted later. 3. 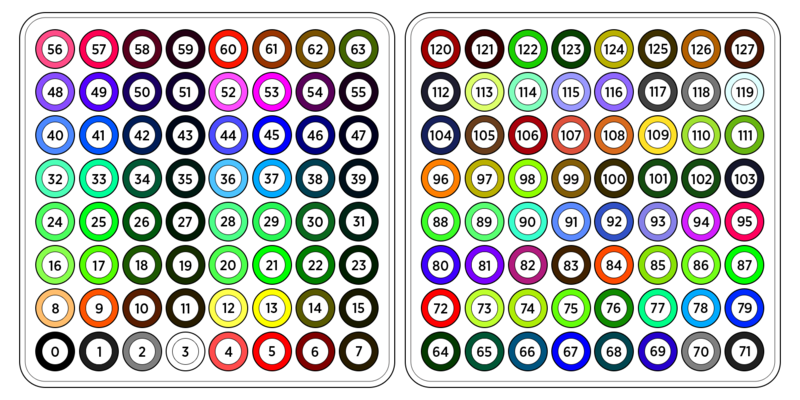 The table below shows the velocity range for each color. Choose your color and select the appropriate velocity within your MIDI clip. We want you to know how great it feels to create your very own song, lightshow, routine, edit, or remix. Open a support ticket if you need a little extra help. If your not having fun, we're not doing our job. Is there a full 64 user guide? Where can I download the free soundpacks that come with the 64? 3. Make sure your Midi Fighter is in “Notes” in the Utility.